If you keep tabs on my progress bars to your left, you may have noticed that Quinn #2 hit 100% a couple days ago. You know what that means? I finished writing the pattern and posted it! The complete package is a 9-page pdf, with nice big photos and instructions in charted and written form. I daresay it looks like a real knitting pattern. I’m pretty pleased with what I put together, although the true judges will be you, my fellow knitters. I had a lot of fun designing Quinn, I hope you will have a lot of fun knitting it! CogKnition posted this on August 17th, 2006 @ 2:35pm in Knitwear Design, Site Updates | Permalink to "Quinn Pattern Posted!" How did I not comment on this sooner? Thank you, thank you, thank you! This is such a great looking pattern, I can hardly wait for a chance to try it! Thank you! I have been looking forward to this! 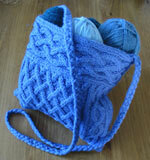 I subtracted two repeats from the top band and fudged the pickups to complete the bag over 128 stitches. I’m writing to say that this smaller version of the top band makes a great headband/earwarmer! Even my husband likes it, so I’ll definitely be doing that again! Awesome! I’m glad to hear it worked out! I hope you can help!